Magna International, a diversified global automotive supplier designs, develops, and manufactures technologically advanced automotive systems, assemblies, modules, and components. Their challenge is to drive innovation while achieving enterprise IT efficiencies and agility. They chose to overcome these challenges by building a private cloud on NetApp for flexibility and enhanced IT services. 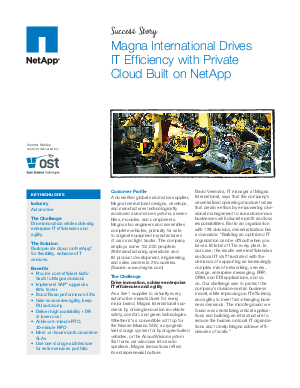 Their benefits provided cost-efficient IaaS/SaaS to Magna divisions, implemented SAP upgrades 85% faster, boosted band performance 33%, gained economies/agility, kept BU autonomy, delivered high availability + DR at lower cost, and achieved 5-minute RTO, 30-minute RPO while using one storage architecture for their entire services portfolio.